Travel to Rome with Rhianna! 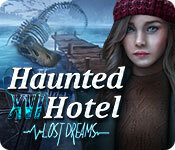 Haunted Hotel: Lost Dreams is available for free download. You can play the downloadable version for free for 60 minutes. After that time if you liked the game, you can buy it online. Downloading Haunted Hotel: Lost Dreams is 100% safe. The game size is 589 MB. Grim Tales: The Nomad new!